There are plenty of recipes and cookbooks to help vegans eat quick and delicious dinners, but what about breakfast and lunch? They're the most important meals of the day! To solve this vegan eating dilemma, enter Maya Sozer-private chef, talented food photographer and master of tasty vegan goods. For meals on the go during your busy schedule, Maya has 80 easy and delicious recipes to fuel you throughout the day, along with 80 stunning photographs. For easy grab-and-go breakfasts, awaken your taste buds and energise your brain with Overnight Chocolate Rawnola in a mason jar, Vegan Sweet Potato Pancakes or Chocolatey Cinnamon Rolls in Tortillas. Maya has an arsenal of the tastiest vegan sandwiches, soups and salads that can satisfy hunger in a hurry or get wrapped up for easy, delicious lunches at work. Just wait till you try the The Best Vegan Bagel Salad, Spinach Lentil Patties with Lemon Cashew Sauce in a wrap, Spicy Garbanzo Bean Salad Bowl with Tahini Sauce or Cashew Cream of Broccoli Soup. With this cookbook, readers won't have to skip breakfast or buy lunch on a busy day. 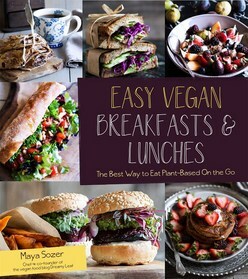 Maya's quick and easy vegan recipes and photographs will inspire readers to eat healthy, wholesome, delicious food all day long. Healthy, delicious and portable plant-based recipes that help you get through the toughest meals to stick to your eating principles.